In 2016, green design is one of the most important carryover trends we’re seeing in the home interiors marketplace. 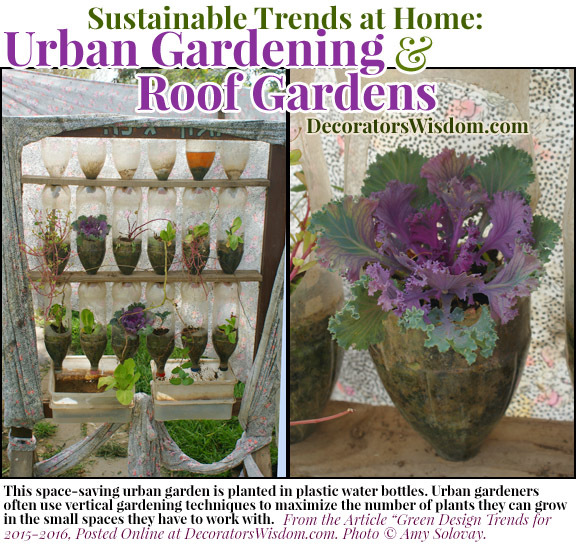 With green living gaining broader acceptance, sustainability is an influential factor to consider when evaluating the current home and garden design trends for 2016. Let’s take a look at some of the green design trends we see happening in 2016. LED lighting is one of the top green trends for 2016 — and, based on energy experts’ forecasts, it will remain trendy into 2017 and the following years as well. The US Department of Energy has predicted that, by the year 2030, LEDs will account for an estimated 75% of all lighting sales. So, by all appearances, this is a trend that’s in its beginning stages, and will have long-term staying power. In the long term, LED lighting offers consumers an opportunity to increase energy efficiency and reduce their energy bills. The downside is that the upfront installation costs can be higher for LED lighting. However, overall the clear consensus is that the long-term energy cost and energy savings more than justify the upfront expense. 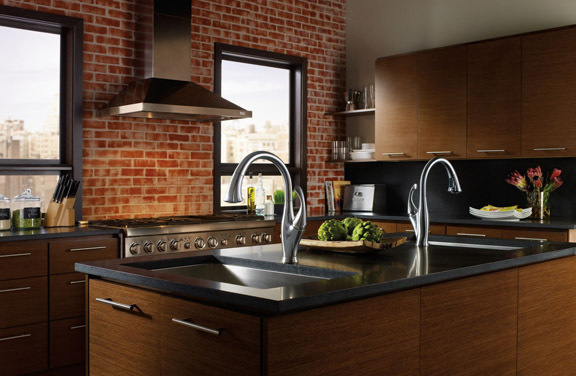 Delta Faucet’s Water-Saving Kitchen Faucet, Known as the Addison. You can buy this faucet at a discounted price on the Amazon website. Photo Courtesy ofDeltaFaucet.com. Pictured Here: Moen’s Wynford collection of eco-friendly bathroom fixtures and accessories. These Wynford lavatory faucets have all earned the EPA’s WaterSense seal for water efficiency. You can buy the Wynford fixtures online at Amazon’s website. Photo courtesy of Moen.com. Water conservation is shaping up to be an important issue for 2016. While this is an ongoing theme, and certainly not a new trend, it’s an important inclusion on this list. In the recent past, water conservation efforts have been a driving factor in the marketplace. The need for water efficiency is contributing to the product lines that manufacturers make available — which in turn influences building, remodeling and decorating projects nationwide. Broader trends are also at play here. Mainstream media has been sounding the alarm over what some analysts perceive to be a looming worldwide overpopulation problem, which they predict will result in inadequate worldwide water resources. This barrage of information has influenced consumer perception, and is contributing to increased interest in water efficient solutions at home, particularly in California and the American southwest. Californians have good reason for concern, as they are feeling the effects of recent drought conditions in their area. Many southwesterners are in search of ways to lower their overall water consumption — and also to lower the corresponding water bills they have to pay. 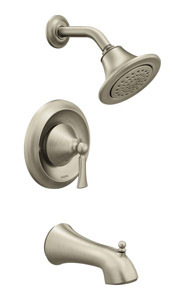 Water-Saving Showerhead and Bath Fixtures From the New Wynford Collection by Moen. Photo Courtesy of Moen.com. Watersense participants are rewarded with a special seal that designates water efficient homes, products, fixtures and appliances that meet the stringent Watersense standards and criteria. Most people don’t think too much about showerheads — but maybe it’s time we stop to consider them for a moment. Did you know that choosing a different showerhead could not only lower your water consumption, but also your power bill as well? At least, that’s true if you shower with hot water, because your hot water heater is also involved in the showering process — and your hot water heater consumes energy when heating the water you shower with. Not only that, the stylish and trendy showerheads available can also help to update the look of your bathroom as well. Pictured Here: The Brantford two-handle high arc bathroom faucet by Moen. This bestselling faucet is on-trend for 2016 for several reasons. The oil-rubbed bronze finish is a popular choice right now; also, the water-efficient design was awarded the EPA’s Watersense seal. You can find the Brantford collection for sale online at a discount at the Amazon.com website. Photo Courtesy of Moen.com. There are bunches of easy ways to conserve water at home. One of the simplest is to install water-saving fixtures in the bathroom(s) and kitchen. This simple action can also result in significant savings on future water bills. Water Saving Toilets — I’m not sure if anyone cares much about toilets when they’re researching interior design trends. Nevertheless, it’s worth including a note about toilets on this list, because toilets do contribute significantly to household water consumption. That alone makes the toilet an important consideration for anyone remodeling a bathroom or building a new home. According to the EPA, toilets can account for as much as 30% of the total water consumption in many households. If you’re looking to lower your water bills, offset costs associated with remodeling, or make tangible investments in your home, a water efficient toilet is worthwhile purchase to consider. If you’re an industry professional handling remodeling or decorating jobs for others, it could be worthwhile to educate your customers about the long-term cost savings and other benefits provided by water efficient toilets. 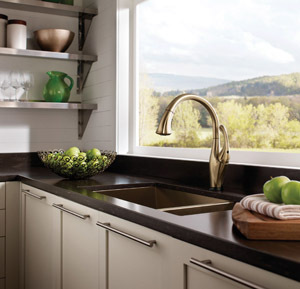 Pictured here: the champagne bronze color of Delta Faucet’s water-efficient Addison faucet. Warm metals such as this are particularly trendy for 2016. Overall, this design is a stylish and timely choice. 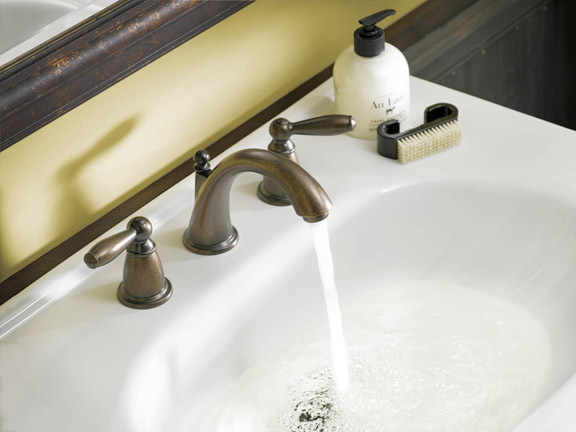 This faucet is for sale at the Amazon website.Photo courtesy of DeltaFaucet.com. The EPA’s WaterSense website is strangely silent on the topic of kitchen faucets, but that hasn’t discouraged certain manufacturers from designing water-efficient faucets to sell to the public. For example, Delta Faucet is a certified WaterSense partner offering a range of water-saving fixtures, including kitchen fixtures. Delta has come up with a kitchen faucet they call “Addison” that’s water-efficient by default, but a user can toggle it into high-powered mode for tasks that require increased water pressure. This could help consumers to maximize efficiency, while minimizing water consumption and the resulting water bills. Water Filtration Faucets and Other Water Filters — Right now, there’s strong demand for water filtration units and devices. For some industry professionals, there could be potential to upsell these sorts of devices along with kitchen faucets and fixtures, as part of a kitchen redesign or remodeling project. The Rachio Wifi-Enabled Smart Irrigition Controller, Available for Sale at the Amazon Website. Some home automation innovations are more useful than others. Certain automated Wifi irrigation controllers are getting the “thumbs up” from homeowners, and they’ve also earned the EPA’s WaterSense seal of approval. 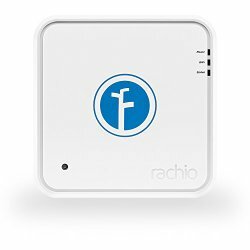 An interesting example is the Rachio IRO smart Wifi enabled irrigation controller. This device is intended to both automate your sprinkler’s watering schedule and conserve water. A number of users have contributed positive reviews testifying that the device does, indeed, save time, money and water. There’s a trend towards energy efficiency in every aspect of home ownership, and there has been significant demand for extra insulation in new residential construction. The demand for local food is increasing. There are pockets scattered throughout the USA where demand for locally-grown food far outpaces supply. Demand for organic foods is also increasing. While organics still comprise a small portion of the food market overall, the growth we’re seeing in this sector far outpaces the growth of the US economy as a whole. Many consumers who want to consume locally grown or organic foods are deterred by the high costs, and looking for less expensive solutions. The result: increasing numbers of urbanites and suburbanites are transforming portions of their patios, balconies, kitchens, homes, roofs, and backyards into micro-gardens. Roof gardens are particularly trendy at the moment. Window boxes and kitchen herb gardens are also gaining in popularity. If you’re not yet familiar with the concept of what a “smart home” or an “automated home” is, I encourage you to check out our article entitled “Smart Home Automation Ideas” for a more thorough explanation. In a nutshell, a “smart home” is sort of like a “smartphone” in many ways; it can be wired into the Internet, and accessed remotely — often through an actual smartphone or similar device. There’s much more to it than that, but that’s the idea. At face value, it seems that “smart homes” could potentially contribute to a greener, more sustainable future — because some of the focus has been on applying the technology to important issues such as reducing energy consumption in the home. If one examines the potential problems and pitfalls associated with the technology, it’s apparent that there are also some important environmental concerns raised by it as well. The related issues are largely outside the scope of this trend report, so for the purpose of staying on topic I’ll just say that smart homes are an important inclusion on the trend list for 2016 — and they could possibly fall on either side of the “sustainable / unsustainable” list, depending on how the smart home technology is installed, implemented, applied and used. I’ll leave you to research the details further if this trend is of interest to you. Consumers are increasingly shopping for low-impact materials to use when remodeling, building and decorating their homes. They are also becoming more conscious of the toxic nature of many building and decorating materials that have been popular in decades past — and looking to reduce the overall toxicity levels that their families are subjected to daily. Thanks to this increased consciousness, there’s growing demand for organic textiles, natural fabrications and sustainable building materials. Non-food organic products—including flowers, fiber, household products and pet food—are currently a very small part of the total organic market, but are making quick in-roads. Conventionally farmed cotton is sprayed with high concentrations of synthetic pesticides and other harmful chemical inputs. Because of this, conventional cotton crops are responsible for significant amounts of environmental harm. Cotton is also one of the most important genetically modified crops, which many environmentalists — myself included — see as being harmful to the ecosystem, to wildlife, and to human health. What can you do about these issues? For starters, you can look for products made from certified organic cotton. Many consumers are doing just that, which is fueling the current trend for organic cotton and manufactured products made from organic cotton fabric. In 2016, buying end products made with organic cotton is the only practical way to ensure that your cotton was farmed in a sustainable and responsible way. If you’d like to review the facts, figures and statistics backing up these claims, I encourage you to explore the references section at the end of this article, because I’ve posted links to various sources that will give you more insights into the horror show that is the commercial cotton market. Who’s Buying Organic Cotton Products? The demographic group most likely to buy home furnishings made with organic cotton: new parents. Demand is particularly strong for organic baby bedding, organic baby blankets and organic nursery accessories. Organic cotton is also a popular choice for kitchen textiles, particularly dishcloths, dish towels, placemats, table linens and anything else that will be used in close proximity to food. In the bedroom, organic bedding is becoming more widely available. Earth-Friendly Tile — There are a broad range of possible applications for tile, both inside and outside the home. Whether you use tile for flooring or other purposes, you’ll enjoy having a range of on-trend and earth-friendly options available. Reclaimed tiles are particularly relevant to the discussion here. While this segment is still a small portion of the overall market, we saw a surge of increased interest in reclaimed tile as of March 2015. Interest has been particularly strong in the UK, although there’s interest from the USA as well. Stone tile is also in demand, with the majority of the interest coming from the USA and Canada. Hardwood Flooring — It would be a little silly for me to write that hardwood flooring is trendy at the moment. Does hardwood flooring ever really go out of style? No, I think not. Of course, current economic realities being what they are, there’s also strong demand for the less expensive laminate flooring as well. Reclaimed wood flooring is a particularly eco-friendly solution that’s on-trend at the moment. In the UK, USA and Canada there’s a steadily growing interest in, and demand for reclaimed wood flooring materials. Reclaimed flooring has its challenges, but for those who are able to overcome them, it’s easy to see the appeal of this category; reclaimed flooring is not only sustainable, it also offers the homeowner unique character and charm. In theory, it should also be affordable — and in some cases, it is. However, in some areas, demand has outpaced supply, so the prices for reclaimed wood flooring are are higher than you might expect.